If you like a thicker soup base, add 1 can (15 oz.) of red, black or white beans, drained. Place all ingredients in a large pot, cover and bring the liquid to a boil, reduce heat to low and simmer with lid slightly tilted for 30 minutes. Next prepare your choice of fresh or frozen vegetables combined to make about 1 - 2 cups for each vegetable (total of 8 - 10 cups needed). escarole, cut into pieces, add to soup when it is almost finished cooking. Simmer the vegetables until tender, about 20 minutes. If zucchini or escarole is one of your vegetables, add this 5 minutes before soup is done, otherwise it will be overcooked. Add 1/2 teaspoon of Liquid Smoke (optional) and freshly ground pepper to taste. Serving suggestion: ladle hot soup into large bowls over 1/3 cup cooked rice, penne pasta or macaroni noodles. Keeping rice and pasta separate until serving will keep these ingredients from becoming soggy by absorbing too much liquid. 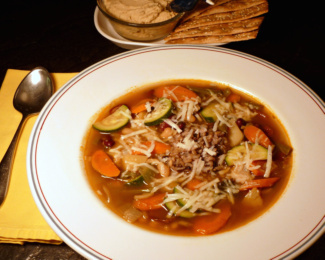 Top this bowl of soup with a tablespoon of freshly grated Parmesan cheese (optional).